These folded 4.5 x 6.25 Rustic Wedding Party Cards come in a Pack of 5. 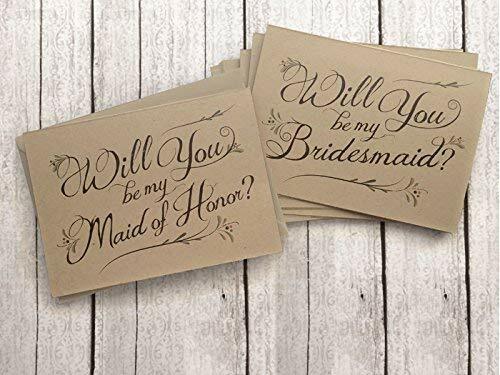 You will receive 4 Bridesmaid Cards and 1 Maid of Honor Card. They are printed on 100% recycled Kraft card stock, and include beautiful and durable white envelopes. Insides are blank for you to write your own greeting. Cards are packaged in a clear cello closed sleeve. If you have any questions about this product by Side Street Designs, contact us by completing and submitting the form below. If you are looking for a specif part number, please include it with your message.